United States Coast Guard Auxiliary Station Galveston Flotilla. Radar is an acronym for Radio Detection and Ranging. Radar uses microwave radio waves to identify the location, course, and speed of objects. The center of the radar screen represents the position of the boat. 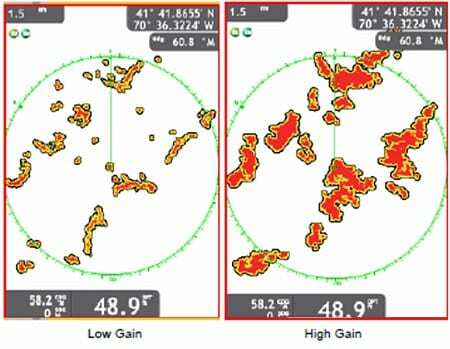 When used properly, the radar enables you to identify land masses and other vessels, determine the distance from your vessel to contacts (range), and determine direction from your vessel to contacts, even in restricted visibility (bearing). The Station Galveston Flotilla of the US Coast Guard Auxiliary operates out of the USCG Station Galveston base on Galveston Island. 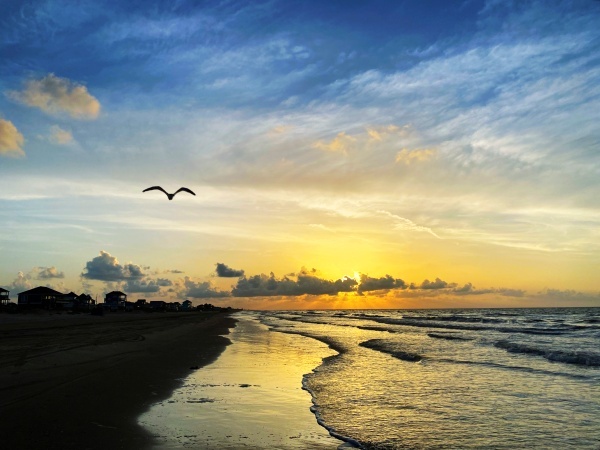 They provide assistance to the Coast Guard by providing maritime observation patrols in Galveston Bay; by providing recreational boating vessel safety checks; and by working alongside Coast Guard members in maritime accident investigation, small boat training, watch standing, and property administration. A radar’s pedestal transmits pulses of radio waves, then receives those waves that bounce off objects. The returns are processed and contacts are displayed on the radar screen in intensities according to echo strength. Images on a radar screen differ from what is seen visually by the naked eye. 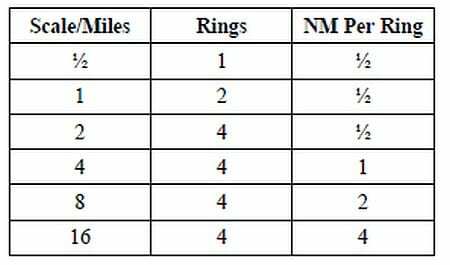 This is because some contacts reflect radio waves (radar beams) better than others. Familiarity with the operating area helps to identify images that are displayed. The radar does not paint a detailed picture of an object. Instead, all objects are displayed on the radar screen as indistinct masses of color. Knowing the location of land masses and man-made structures- such as bridges, docks, and navigational aids- helps differentiate those objects from other vessels on the radar. The main purposes of radar are navigation, weather forecasting, and collision avoidance. Your own vessel is always at the center of the radar screen, unless the user inputs an offset. If you are moving toward a stationary object, such as a day beacon, the radar picture will give the impression that you are stationary and the day beacon is moving toward you. This is known as relative motion as the radar shows the day beacon is changing position relative to your own vessel rather than its fixed position on the surface of the Earth. When considered with a moving object, the relative motion depends on the movement of both your vessel and the tracked object. The movement of a contact across a radar screen is seldom an accurate representation of the target’s movement across the Earth. It is, however, a good representation of the target’s movement in relation to your vessel. Radar isn’t just for avoidance of collisions with other vessels. It can be used to avoid collisions with many types of instructions, as indicated by the chart. The scale is typically shown in the upper left corner of the screen. Several adjustments can be made to enhance the radar image. Some of the settings that can be changed are the gain, the range scale, sea clutter, rain clutter, noise and interference rejection, and the use of echo trails. Gain on the radar is how well a contact or target appears. By increasing gain, the amount of echo returned is increased and the contact is seen much easier. If you adjust the gain too high however, excessive background noise can hide contacts from view. Conversely, the less gain, the less likely the contact will be seen. If you adjust the gain too low, objects with weak echoes do not display on the screen, increasing the risk of collision. The gain is set correctly when some background noise displays on the screen. 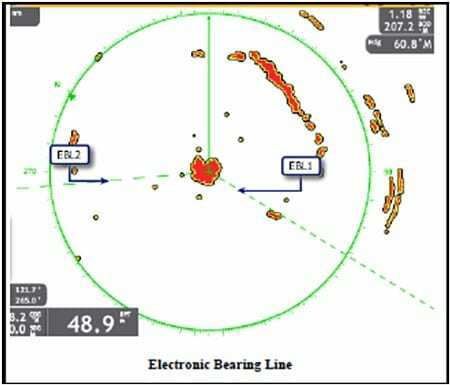 Electronic Bearing Lines (EBL) measure the bearing from the boat to a contact. Radar bearings can be measured in true, magnetic, or relative direction. To obtain a target’s bearings, the EBL is adjusted until the line crosses the target. The Automatic Radar Plotting Aid (ARPA) is a feature that allows you to track the movement of up to 30 radar contacts. ARPA also provides information about each tracked contact, such as Course Over Ground (COG), speed, range, bearing, and Closest Point of Approach (CPA). Targets can be acquired manually, or an ARPA acquisition area can be established so any contact that enters the area is automatically acquired and tracked. Constant bearing, which is associated with a risk of collision, can be determined by using the Electronic Bearing Line (EBL). If the contact is another vessel, and that vessel appears to slide straight along the EBL, the implication is that it is on a constant bearing and there is a risk of collision. Unless someone takes action to change the situation the contact will continue along the EBL until it reaches the center of the screen, the position occupied by your boat. Sea clutter refers to the reflected echoes from ocean waves. The clutter is displayed in the central part of the screen and increases in width as the height of waves increase. Too little sea clutter filtering allows objects to be obscured by the clutter and increases the risk of collision. Too much sea clutter filtering can prevent contacts from displaying. Rain clutter can display on the radar when the boat is in or near rain or snow. The Rain clutter control breaks the continuous display of rain or snow reflections into a random pattern. Rain control can also be used to reduce the target clutter in good weather in busy harbors. Too little rain-clutter filtering allows objects to be obscured by the clutter. Too much rain-clutter filtering can prevent contacts from displaying. The height of most radar transmitters is 6 ft to 14 ft above the surface of the water. This height does not allow for true tuning of sea clutter and rain clutter. Adjusting the sea or rain clutter can have the opposite effect as intended due to the low height of radar. Adjustments should be performed in small increments and used sparingly only during heavy weather. Operating under the radar means operating where you cannot be detected by radar. While this condition might be useful for spy planes or smugglers, it is not a desired condition for boaters running in limited visibility when the goal is to avoid a collision. 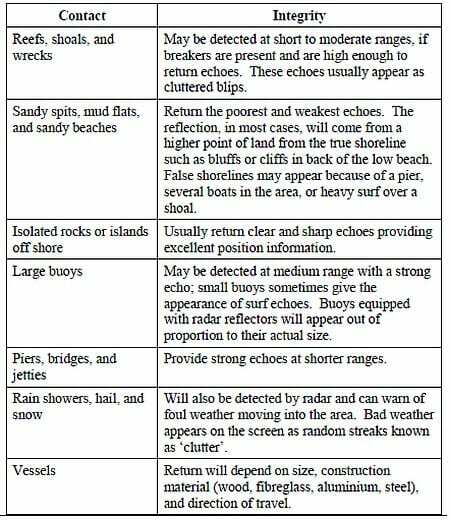 The point here is that although another vessel may be operating with radar, there is no guarantee that the vessel can detect your boat, and you need to operate accordingly. If your boat is small or has a low profile, there is a good chance that you will not show up on another vessel’s radar. 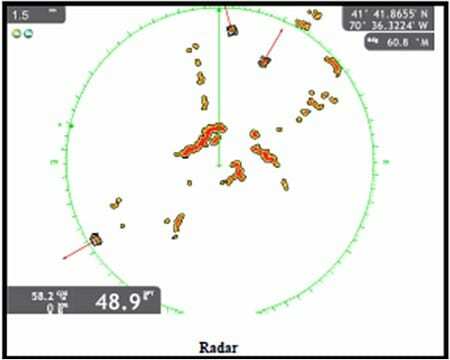 If you are the vessel that is operating with radar, you must keep in mind that you may not be able to see another vessel with your radar, especially if it is a small boat operating very close to your vessel. The boat may literally be below your radar beam. 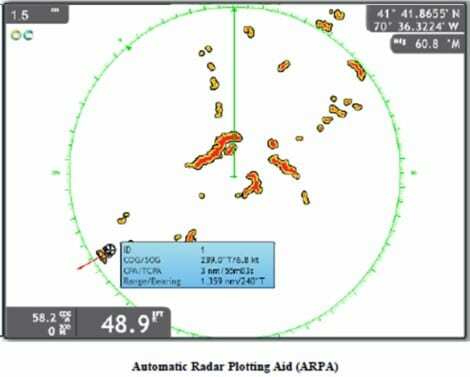 Radar is generally a good tool to use when operating your boat under conditions of limited visibility, but it is not the end all method but rather an additional method of avoiding a collision. You can safely use radar to help avoid a collision as long as you remember that radar cannot always see every possible contact. For more information on boating safety, please visit the Official Website of the U.S. Coast Guard’s Boating Safety Division at www.uscgboating.org. 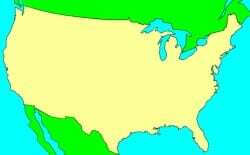 Questions about the US Coast Guard Auxiliary or our free Vessel Safety Check program may be directed to me at rt.currie@gmail.com. I am available to perform free Vessel Safety Checks, and I will come to your location to perform them. SAFE BOATING!